X-ray computed tomography (CT) is a powerful tool for noninvasive imaging of time-varying objects. In the past, methods have been proposed to reconstruct images from continuously changing objects. For discretely or structurally changing objects, however, such methods fail to reconstruct high quality images, mainly because assumptions about continuity are no longer valid. In this paper, we propose a method to reconstruct structurally changing objects. Starting from the observation that there exist regions within the scanned object that remain unchanged over time, we introduce an iterative optimization routine that can automatically determine these regions and incorporate this knowledge in an algebraic reconstruction method. The proposed algorithm was validated on simulation data and experimental μCT data, illustrating its capability to reconstruct structurally changing objects more accurately in comparison to current techniques. Van Eyndhoven, G, Batenburg, K.J, & Sijbers, J. (2014). 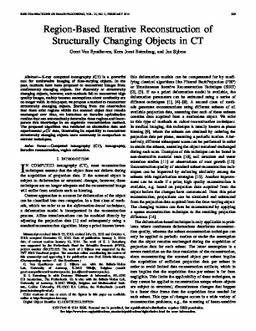 Region-Based Iterative Reconstruction of Structurally Changing Objects in CT. IEEE Transactions on Image Processing, 23(2), 909–919.